The 4928C - 1 Part Bilingual Spanish Restaurant Guest Checks Custom Imprinted work great in restaurants where Spanish is important. 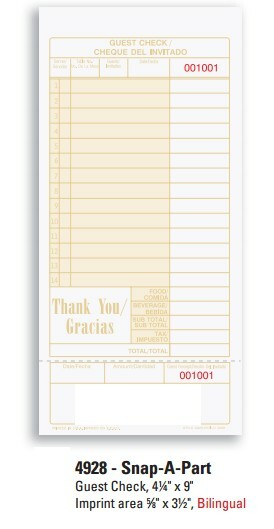 The 1 Part Bilingual Spanish Restaurant Guest Checks Custom Imprint is an attractive guest check with 14 lines on an attractive form with a tear away guest receipt for your customer's tax or other record keeping needs. 1 Part Bilingual Spanish Restaurant Guest Checks Custom Imprint is printed on a 32 pound bond paper. This is a stiffer paper we call medium board. For an idea of the paper, the paper typically used for your home printer is a 20 pound bond paper. This bar guest checks is printed with brown ink unless otherwise specified. Restaurant Guest Checks Custom Imprinted for your restaurant can be padded into sets, hot-glued together with a hard backer for writing support and security, The cost for padding this guest check is #13. The cost to pad guest checks is just $13 per case.